Sweet 15 Special Guest Slot Review - Casino Answers! Sweet 15 is a 5-reel, 20-line video slot developed by Cryptologic, featuring a wild symbol, scatter wins, multipliers and a free spins feature. You can play the Sweet 15 Special Guest Slot at [Americans: Unfortunately due to legal restrictions you are unable to play at any of the online casinos this game is at. We recommend you trying playing the unique slots at Win A Day Casino instead.]. The Sweet 15 casino game is a penny slot. Bets on the Sweet 15 slot machine are $0.01, $0.05, $0.10, $0.25, $1, $2, $5 and $10 per line. You can select up to 20 paylines per spin on the Sweet 15 video slot. The maximum total bet on the Sweet 15 slot game is $200 per spin, giving it a very good betting range for most online slots players. You can play the Sweet 15 online slot by selecting your bet and pressing “Spin.” To play all 20 lines, you can use the “Bet Max” button to spin the reels. The top-paying symbol on the Sweet 15 video slot is the Champagne symbol. If you land 5 Champagne symbols on a selected payline, you will win the 3000 coin top jackpot. The next highest paying symbol is the Gift symbol, which can pay out up to 1000 coins. The scatter symbol is the Happy Birthday symbol. You can get a scatter win of up to 200X your total bet by landing two or more Scattered Happy Birthday symbols on the reels of Sweet 15. The wild symbol is the Birthday Cake. It only appears on reels 1 and 5 and will substitute for all other symbols except for the Scattered Happy Birthday symbol. The Birthday Cake symbol is a wild multiplier, so the prize will be doubled when one or more wild multipliers appear in a winning combination. When the Birthday Cake symbol appears on reels 1 and 5 at the same time, you will win 15 free spins at a 3X multiplier. All winnings are tripled during the Sweet 15 free spins feature. The free spins feature can be re-triggered. Free spins are played at the lines and bet of the trigger game. Free spins feature wins are added to payline and scatter wins. 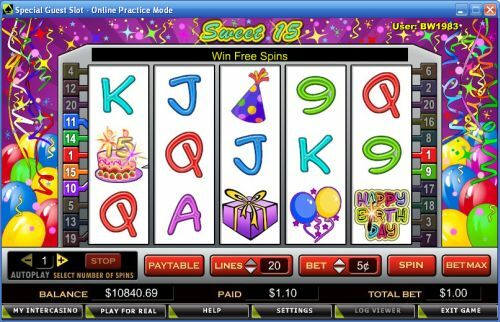 You can have your own sweet 15 party when you trigger the Sweet 15 free spins bonus feature at [Americans: Unfortunately due to legal restrictions you are unable to play at any of the online casinos this game is at. We recommend you trying playing the unique slots at Win A Day Casino instead.]! The Sweet 15 video slot has a basic autoplay feature. You can use the “+” and “-” arrows under “Autoplay” to select from 1 to 99 autoplay spins. To start the autoplay mode, select your bet and press the “Spin” button or use the “Bet Max” button. To stop the autoplay mode (at any time), press the “Stop” button next to the autoplay counter. 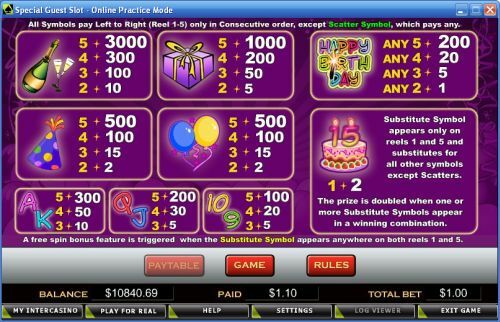 If you are celebrating a birthday (hopefully not your 15th) or you just want to play Sweet 15 or any of the other Special Guest Slots, you can make it a sweet 15 by signing up and make a deposit today at [Americans: Unfortunately due to legal restrictions you are unable to play at any of the online casinos this game is at. We recommend you trying playing the unique slots at Win A Day Casino instead.]! How come I can’t find the Sweet 15 video slot? The Sweet 15 is just one of the many rotating slots on the Special Guest Slot. Click the “Special Guest Slot” at your Cryptologic casino (such as [Americans: Unfortunately due to legal restrictions you are unable to play at any of the online casinos this game is at. We recommend you trying playing the unique slots at Win A Day Casino instead.]) and Sweet 15 or a similar video slot will come up. Can USA players play the Sweet 15 slot game for real money? No, American players cannot play Sweet 15 or any of the Special Guest Slots at Cryptologic online casinos. For an alternative, please visit a Rival-powered casino like Bovada.